The Zamir Chorale of Boston’s International Virtual Choir of Louis Lewandowski’s “Halleluyoh” is live! The Zamir Chorale of Boston thanks its 50th anniversary sponsors, leadership committee, virtual choir participants and StormPort Productions for making this project a reality. The Halleluyoh Virtual Choir is also supported in part by a grant from the Newton Cultural Council, a local agency which is supported by the Mass Cultural Council, a state agency. What is a virtual choir? It is a performance made up of singers from different locations, who come together virtually to share their passion for choral singing in a new and unique way. Eric Whitacre created the first virtual choir. See https://youtu.be/D7o7BrlbaDs (and this great TED talk https://youtu.be/2NENlXsW4pM). The goal of our virtual choir is to introduce the wonderful music of Lewandowski to singers, conductors and audiences worldwide. 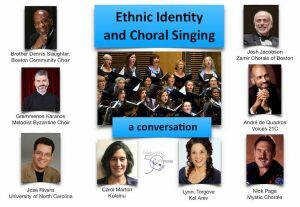 We want more people to recognize that great Jewish choral music exists! You sit in front of your computer and video-record yourself singing your own part of Lewandowski’s “Halleluyoh.” You then upload your recording to YouTube (we’ll tell you how). We take these recordings and synchronize them to make one enormous virtual choir – an ensemble of hundreds of voices from around the world, united through their love of this music. Why a Halleluyoh Virtual Choir? Love makes the music immortal! You know who Louis Lewandowski was—the great composer and music director at the New Synagogue in Berlin in the second half of the 19th century, the composer of liturgical classics such as Mah Tovu, Enosh, Halleluyoh, Zocharti Loch, Lecho Dodi, Ki Vonu Vocharto (the tune we still sing for Friday night Kiddush), and so much more. On Lewandowski’s grave is the inscription “Love Makes the Song Immortal.” We’re on a campaign to ensure that Lewandowski’s music will not die, that it will be performed more and more, rediscovered by Jewish choruses and synagogue choirs. But even more significantly, we want this music to be recognized by all for its greatness so that it can stand proudly alongside the music of his Christian contemporaries in general programs of great choral music. So we have embarked on a project that aims to virtually bring together hundreds of singers from around the globe, all singing Lewandowski’s greatest anthem, his setting of Psalm 150, Halleluyoh. Our team of professional editors is assembling the video recordings that people have sent in to create this virtual choir. It will be blended with historical pictures of Lewandowski and his synagogue. It will tell the story in a most compelling way. Lewandowski’s music will be immortal. And the final product will be featured on YouTube and sent to conductors of all kinds of choirs throughout the United States and beyond. Won’t you join us? We are asking conductors to share the enthusiasm with their singers. We are asking singers to sit in front of their computers and record themselves singing their part to Lewandowski’s Halleluyoh, and then to send that video recording to our editors. There are step-by-step instructions to make it doable even for those of us who are technologically challenged. We hope to see you on the screen. For further information, please visit https://www.zcbvirtualchoir.com.